Oktoberfest is one of the most famous festivals in Europe every year, involving liters of beer, countless pretzels and hours of singing German songs. It is hosted in Munich Germany, however smaller versions of the festival take place all around the country. If you haven’t been before, it is hard to imagine the reality of such a crazy festival. I went with Stoke Travel and would highly recommend this as it heightens the craziness and enjoyness of the experience to the next level. I’ve been on two trips so far with Stoke Travel and they are by far my favourite travel company. If you’re a laid back party goer then they are definitely for you. Each year they run Stoktoberfest and set up a mean campsite for those wanting to go to Oktoberfest and meet some new people on a budget. Quote BIGADVENTURES when you book for free beer and sangria for the entire time! 8:30 You wake up to the sound of people already causing drunken shenanigans. You decide to get up and at least take advantage of the hot breakfast (and maybe partake in shenanigans). 8:45 You indulge in hot bacon and eggs accompanied by a few beers with mates as you brave the day ahead. 9:30 You blindly follow the crowds and head into town to the festival, but not before doing a beer bong on your way out! 10:00 You make your grand entrance into the festival dressed in Lederhosen and Dirndls and take a few pictures out the front with the ‘Oktoberfest’ sign. 10:10 Pick a beer hall (Avoid the Hofbrahaus at all costs as its the busiest with drunk tourists and impossible to get a seat). 10:15 You line up to get into said beer hall (this can be a short or long process depending on the time and hall). 10:30 Once you’re let in, you commence the ‘find a seat’ challenge. This involves wandering around and politely asking groups if the empty half of their table is available, of which they will usually yell something in German back at you, meaning no. If you get there after 10am it will be hard to find a seat unless you’re a party of 1 or 2. This is where big groups are not easy to manage. People who go each year reserve a table for their big group of friends a year in advance. 10:45 At this point you usually either find a seat, or have exhausted all options in which case you leave and go back to step 1. 11:00 A beer will essentially be ordered on your behalf by the humongous waiter (you have to be drinking to keep your seat). 11:05 You will be served a beer for 10Euro, but you pay 11Euro or more as a tip to keep their service. By the end of the day you’re in such a good mood you end up giving them a 20 Euro note and “Don’t worry about the change mate!” happens a few times. 11:20 Everyone has downed their stein in excitement as if its a pint. This will catch up to you soon enough, but for now it’s time for stein #2! 11:30 A table nearby will stand up, start belching out a German song and spill beer everywhere. Everyone joins in and yell/mumbles the unknown words in excitement as this is the true Bavarian Oktoberfest experience! 12:00 You’re feeling a little hungry which means it’s time to order the famous Bavarian roast chicken lunch and a pretzel. 12:15 You devour the chicken in under 5 mins and order stein #3. 18:00 This continues for the entire day until YOUR table is the one starting the nonsensical chants and songs. You’re also onto stein #8 or #10 but whose counting at this stage! 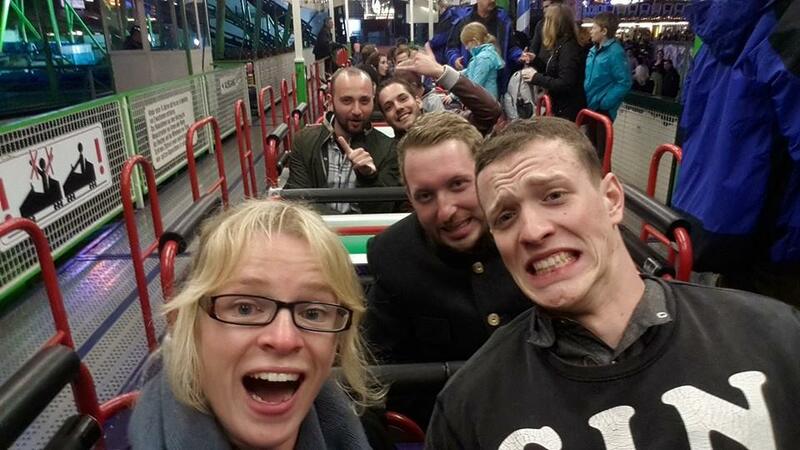 18:30 Someone brings up the idea of rollercoasters and you all agree it’s a great idea and rush out for an adrenaline hit. 19:00 Now feeling nautious and unsure of yourself after being thrown upside down 20 times in 1 minute, you decide it’s best to head back to the Stoke camp for unlimited beer and sangria! 00:00 This goes on all night and at midnight the music slows down and the last remaining survivors hit the sack/pass out on the way to their tent, ready for a early start tomorrow to do it all again! You can eithter meet them there or be picked up by a party bus from London, Barcelona, Amsterdam, Prague and some other places for a small price. Trying to book transport to Munich during Oktoberfest is hell so having that sorted for you already was much easier and it was a great way to meet people. 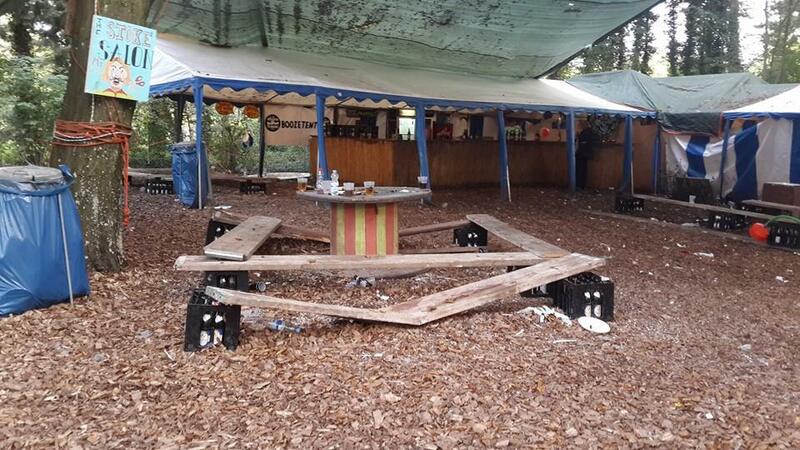 What should you expect at the campsite? 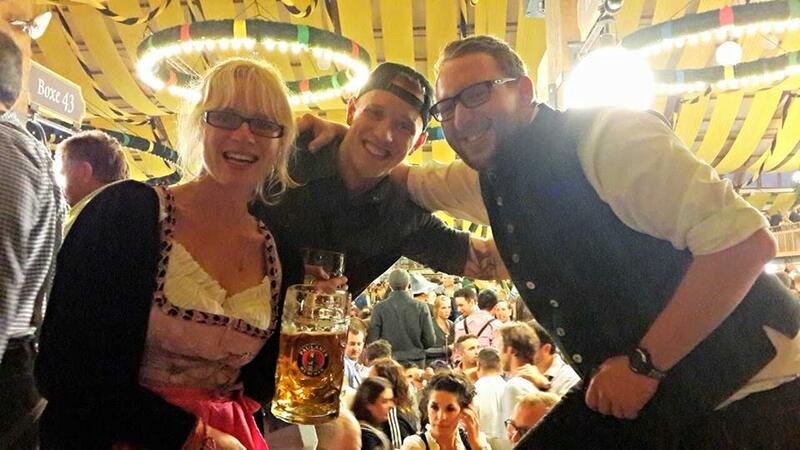 This entry was posted in Festivals, Germany, Oktoberfest Munich, Stoke Oktoberfest, Tours and tagged beer hall, camping, campsite, drinking game, Munich, Oktoberfest, Stoke, Stoke Travel, Stoketoberfest. Bookmark the permalink.